A magnitude 7.0 earthquake struck just seven miles north of Anchorage at 8:29am on Friday morning, at a depth of about 27 miles. The earthquake caused power outages, damage to roads and buildings, and closures of schools, businesses and government offices. There is no official count of casualties yet, but hospitals reported receiving two patients with life-threatening injuries and dozens of less serious cases, including broken bones, injuries from falls, and lacerations from broken glass. There have been no reported deaths. Those are just representative examples of the early reports. Meanwhile, the Anchorage School District asked parents to pick up their children if possible, and students at some schools were moved to other locations that have power. State offices closed for the day, and the railroad and TAPS both shut down for safety inspections. TAPS found no damage and resumed operations. The railroad found heavy damage and remains shut down at the time of this update. 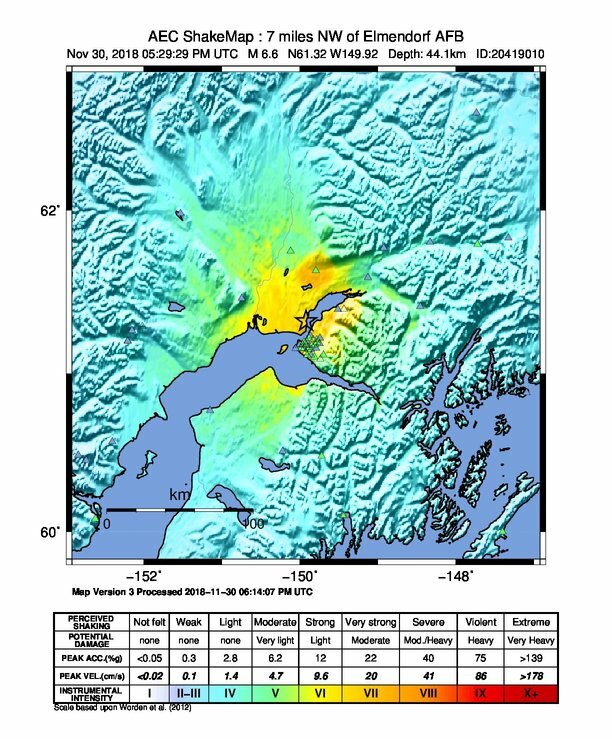 The strongest aftershock, a magnitude 5.7 just three miles north of Anchorage, struck six minutes after the mainshock. As of this update, there have been over 1,400 recorded aftershocks including 17 with magnitudes greater than 4. We have not identified a foreshock for this earthquake. The shakemap from the magnitude 7.0 mainshock shows the intensity of shaking across the region. The strongest recorded intensities were VII (very strong). 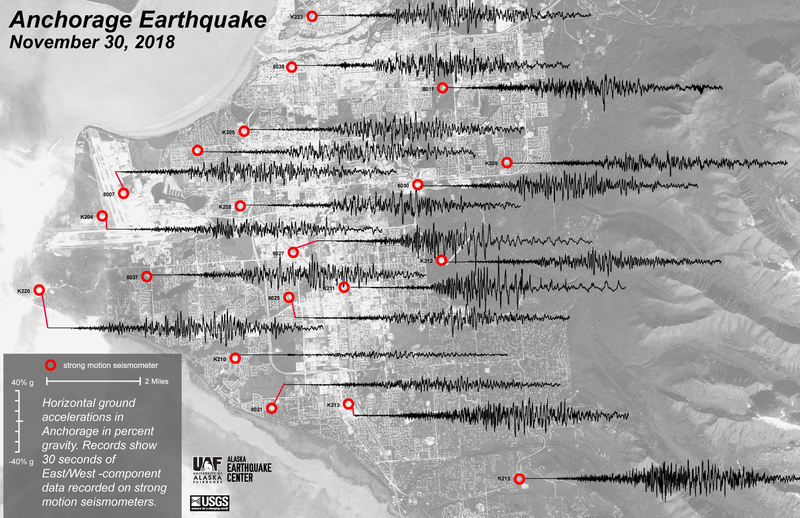 Intensity describes the strength of shaking at a given place, while magnitude describes the amount of energy released at the earthquake's source. This is 30 seconds of east-west shaking across Anchorage. The severity of the shaking varied based on the location, and some areas experienced shaking exceeding 40%g. Most of this data was recorded by strong motion sensors installed in Anchorage schools and firehouses. Here's a ground motion visualization for the first hour after the earthquake. Seven major aftershocks are notated, but you can see many smaller ones on the stations nearest the epicenter. At one of our closest stations, on top of Mount Susitna (the circle just to the left of the red star), the intense shaking caused the sensor mass to became stuck off-scale. It was electronically re-centered by our staff at around 9:20 am.